Super cute vintage Easter Bunny Rabbit in Original Box. 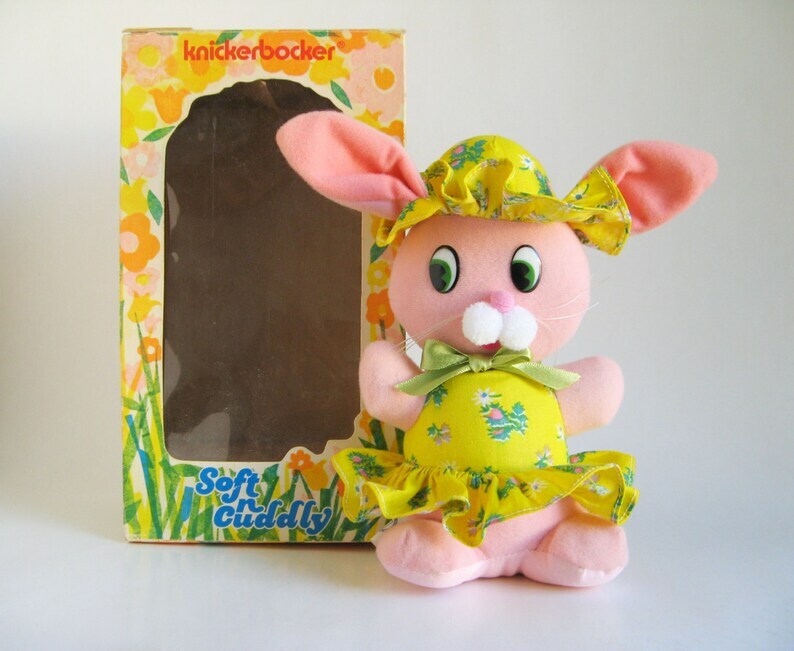 Soft n Cuddly brand made by KNICKERBOCKER in 1974. This sweet pink bunny rabbit is wearing a pretty yellow dress & matching hat. The skirt is more of an apron and is open in the back. She has wire in her ears so you can pose them in a cute way. Shows very little signs of wear from play. The original box features fantastic 1970s colors of orange and yellow. The back of the box has a pop up card you can color yourself and then cut out and stand up. Overall the box is still in good shape. There is wear and a few tears on the top of the box. © KNICKERBOCKER TOY COMPANY, INC.